Tucked away in a peaceful old farm courtyard with farm buildings converted into lovely modern cottages. Bluebelle cottage is situated in the old farm of Moortown, outside the Hamlet of Chawleigh near Chulmleigh in the North Devon countryside. Chulmleigh is a pretty, lively village with at least two pubs an Indian restaurant plus loads of local shops. There is a golf course nearby and plenty of lovely walks and cycle trails. Bluebelle is perfectly located to explore the delights of Devon with both Exmoor and Dartmoor within a one hour drive and the stunning North Devon coast only 30 minutes away. Bluebelle is an "upside down" cottage with the bathroom and bedroom on the ground floor. As you enter the cottage there is a useful hallway with coat hooks and place to store boots after a day out walking. To the right is a modern bathroom with curved shower with removable head, WC and wash-basin and a heated towel rail. The bedroom with small king-size bed ( which can be split into two singles) is down one step and is decorated with light cream and blue colours and the windows look out onto the garden and woods beyond. The bedroom has a chest-of-draws and two bedside tables with lights and a pretty window seat plus a small alcove with curved seat and under stairs closet. There is a door which leads to a charming patio and garden with shrubs. Both the bedroom and the main living area on the first floor have exposed french beams and vaulted ceilings. As you go up the stairs there are local art-works on the walls and high vaulted ceilings with exposed beams which create a lovely bright open space. The living area consists of a well equipped kitchen with electric cooker, fridge with freezer compartment, microwave, double toaster and kettle plus a handy breakfast bar with four chairs. Two the left and right of the room are large windows with a double sofa in one corner and a comfy arm-chair in the other with reading lamps and a nest of three coffee tables. There is a wall mounted TV and DVD. The cottage accepts one dog and provides bedding and a dog towel to help keep muddy paws off the carpet. Downstairs bathroom with wood floors and bright walls, a curved shower with detachable head, wash-basin, WC, and heated towel rail. 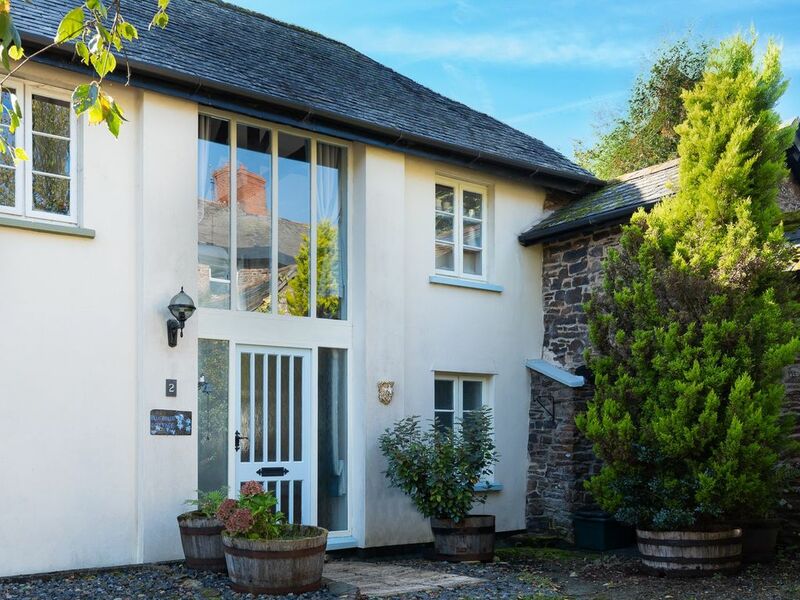 Bluebelle Cottage is situated in a small converted farm courtyard, Moortown, near Chulmleigh, North Devon. It is about 30 minutes to Barnstaple and 40 minutes to the coast and the beaches of Saunton Sands and Westward Ho!